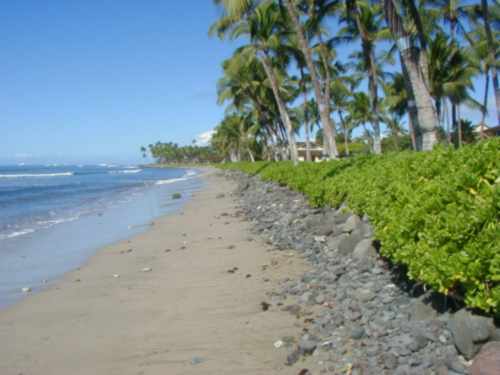 The beach near the townhouse at Puamana has very mild surf and is very safe for swimming. It always has sand. The amount of sand varies from season to season and year to year. But it does not have the huge amount of sand like the beaches in Kanapali. But then again, Kanapali and other big sand beaches often have high surf warnings and Puamana never does. Or from another perspective: a common sight from the Townhouse in the morning is that of strollers being pushed back and forth on the wet sand. Snorkeling is so so but the weather is the best! : the lowest rainfall in all of Maui! The chances of getting chased off the beach due to weather are almost nil. Immediately in front of the unit: a sandy beach with few rocks separated from the Townhouse patio and grass by a low hedge. Waves are typically 0 to 2 feet. Easy access to beach around the hedge 100 feet to the right as you leave patio. So the kids can build sand castles while you relax and keep an eye on them from the unit. Or bring the patio lounges out on the grass and spend the days next to the surf but out of the grit! Picture taken right in front of unit at high tide. The beach farther down in Puamana, again at high tide. Slightly bigger waves: 1 to 3 feet. Puamana as see from the water. Inset of my building and my unit. 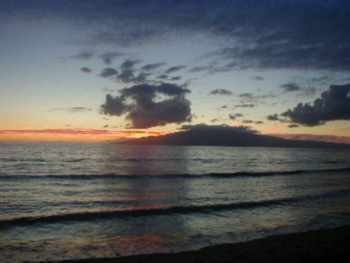 (Island of Lanai in the distance).